Contemporary artist Teruko Hiramatsu has played a more active part overseas than in Japan. However she has always pursued art with a Japanese feel. 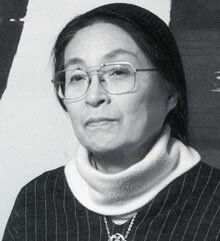 Although she aimed for the top in contemporary art, she did not lose sight of the legitimate soul of Japanese traditional art. It is said that tradition is not set in concrete, it must change as time goes by. Teruko Hiramatsu's art is phantasmagorical. She was born in 1921 and has always faced new challenges in her 87 years. One of her themes is her version of "beauty". That is an aligning of very orthodox Japanese view on beauty with innovative and original technique and expression. This innovative expression is easily understood, when seen in her drawings. This guide tries to put her innovative expression into words. What are the foundations of Japanese traditional culture? Japanese culture goes back to the ancient Jomon and Yayoi eras. Japan is mountainous. Because of the islands' rain-blessed climate, Japan is suitable for rice growing. As rice crops spread in all parts of Japan, people's concerns embraced matters of weather. The sun's huge energy pouring on the ground nourishes bountiful harvests on mountainside and plain. The origin of life on earth is the sun. Humans sensed intuitively that the sun fosters all 1ife on earth, so sun worship developed into the beliefs such as Shinto.